To understand how insulation works, it is first necessary to explain the different ways heat flows through a construction. Physically, heat always moves from areas of high temperature to those at a lower temperature, which is why, in the cold external temperatures of winter, the warmth inside a building will try to escape through walls, windows, roof and floor. Conduction is the transmission of heat through a material, or from one material to another, through direct contact. Conduction can take place in solids, liquids and gases. In relation to construction materials, metals are the best conductors of heat, followed by concrete and masonry. In contrast, wood and insulating materials are poor conductors, as are air and other gases. Convection occurs in gases and liquids. 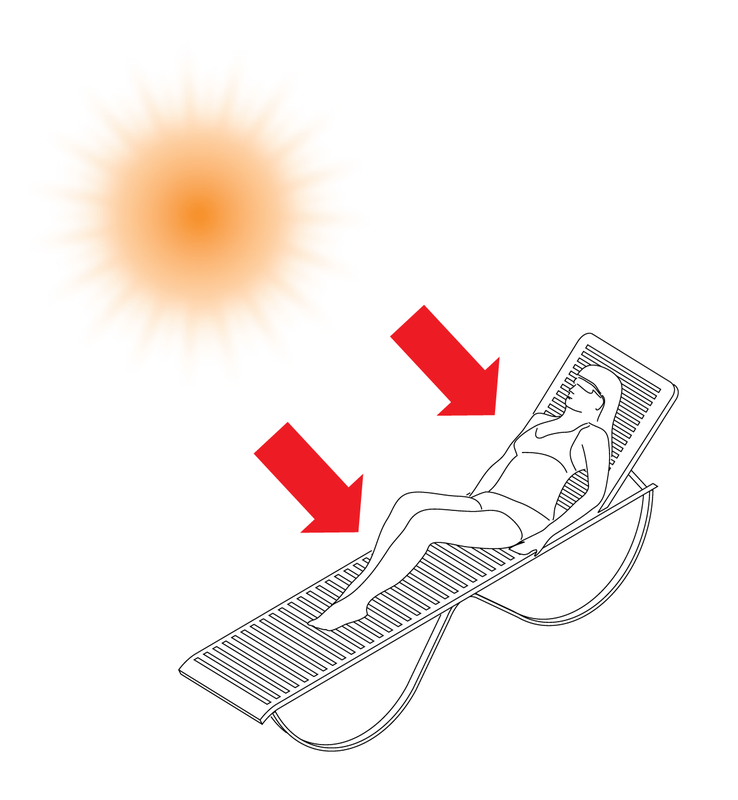 If a hot surface is in contact with cooler air, heat is conducted to the air. This air then becomes warmer and therefore less dense than the adjacent cooler air. 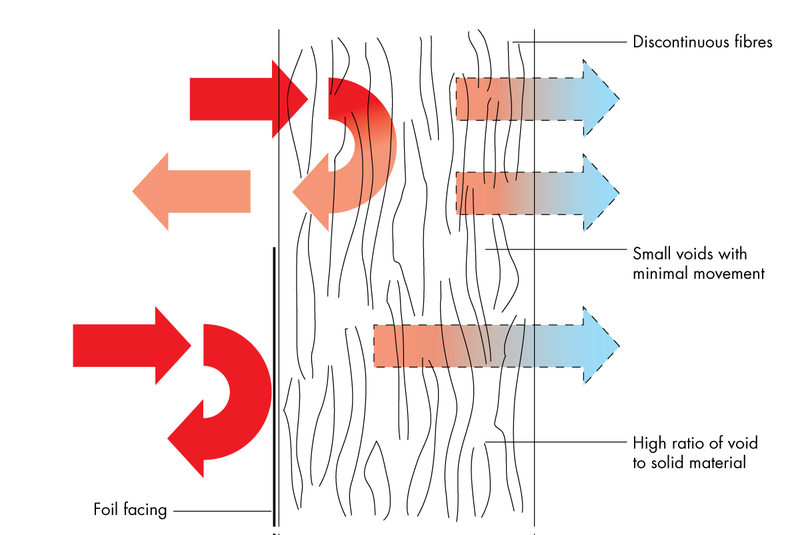 The warmer, lighter air rises upwards and is replaced by cooler air, causing a continuous flow of air by natural convection – gradually removing heat from the hot surface to the air. 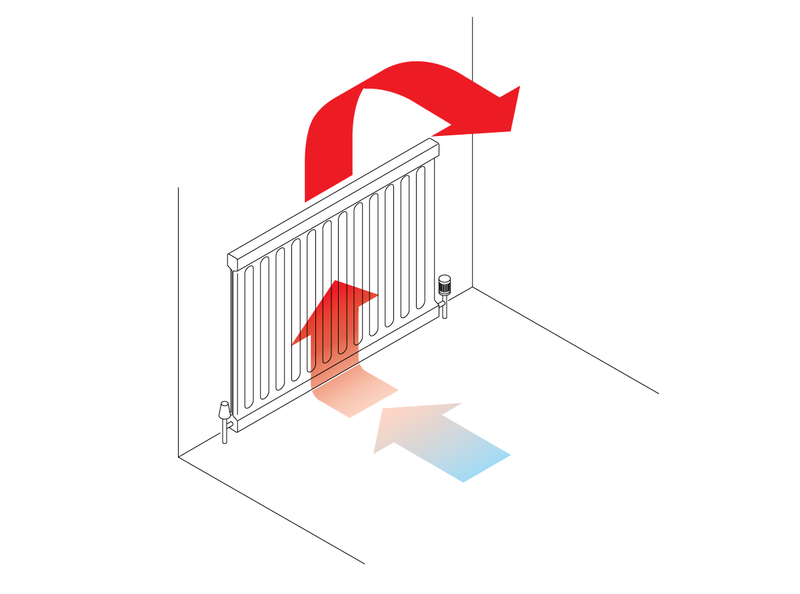 The process is reversed if warm air comes into contact with a cold surface. In constructions, the convective heat transfer we are interested in occurs mainly in wall and roof cavities. Radiation is the transmission of infra-red radiant energy from a ‘hot’ surface to a ‘cold’ surface through air or a vacuum. Radiant energy moves through space without heating anything in between – the energy is only absorbed when its path is blocked by an object which absorbs the energy and converts it to heat. All materials emit radiant energy to a greater or lesser extent according to their surface characteristics and the temperature of the surface. The higher the temperature of a surface the greater the amount of radiant energy emitted. The most common example of this is the radiant heat from the sun, which travels millions of miles through space, and only has any effect when it is blocked by an object, e.g. people, buildings or the earth itself. In order to perform effectively, an insulation material must reduce heat flow. To reduce heat transfer by conduction, an insulating material should have a very small amount of solid material in relation to void. Additionally, the solid material should consist of thin connecting walls, or discontinuous fibres. To reduce heat transfer by convection, an insulating material should contain small voids or air pockets within which air movement is minimised. Similarly, within a construction, convection can be reduced by having small self-contained air spaces, rather than large ventilated air spaces. The transmission of heat by radiation is stopped when it is absorbed into the surface of a material, this results in a rise in temperature of the material. However that material will in turn emit radiant energy. The most effective surface is a “low emissivity” surface that emits very little radiant energy and absorbs a very small percentage of the radiant energy falling on it. A “low emissivity” surface is characterised by a shiny metallic finish. In a building the transmission of heat by radiation from one internal surface to another is not regarded as heat loss however the transmission of heat from external elements of the building away from the building is. Conversely the unit used to describe the thermal insulation characteristic of a material actually is a measure of how much heat the material allows to flow, this unit is thermal conductivity (units W/mK) this is also known as lambda value (λ). The graph below shows the classical curve type associated with the thermal conductivity performance of traditional bulk insulation materials. This particular graph shows the curve for glasswool products, as can be seen the thermal conductivity of the product is improved as the density of the product increases, however the rate of change diminishes as density increases and ultimately, at higher densities, the thermal conductivity starts to increase. 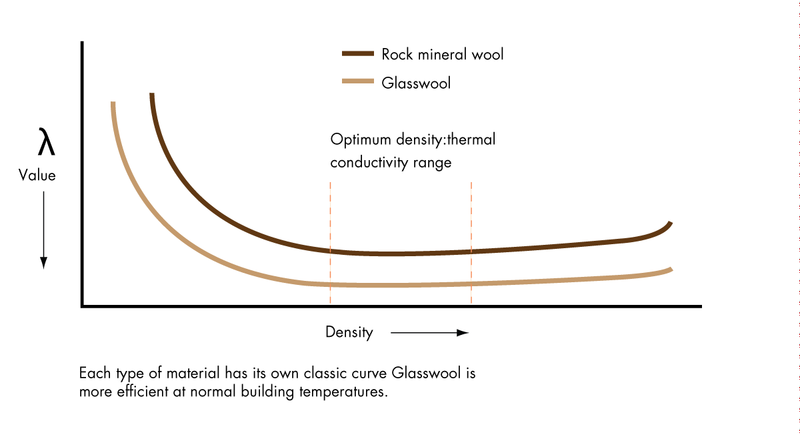 The basic trend of this graph holds true for all bulk insulation materials, and its shape is a function of the varying efficiency of the material at restricting the three different methods of heat flow at different densities. Thermal conductivity also varies with temperature. As temperature rises then the thermal conductivity of materials generally increases. This is not a phenomenon that is of concern in buildings because the variance only becomes significant at temperatures which would not be experienced in normal conditions. It is a consideration when insulating building services and high temperature processes. All insulation products have an inherent variability when it comes to thermal conductivity. This is basically dependent on the method by which the insulation is made and actually ‘works’. Put simply, the lambda value for building insulation products must be such that 90% of the results obtained are within 90% of the quoted value – hence ‘Lambda 90/90’. The aim is to ensure that the values quoted for insulation performance are consistent and give both users and building designers' confidence in the products and solutions that are being specified. Lambda 90/90 effectively means that all thermal insulation products manufactured in accordance with harmonised European Standards have their lambda value tested and declared to the same methodology, establishing a level playing field for all materials. The measure of a material’s ability to transmit heat. Units: W/mK. Also called lambda (λ) value. The measure of a material’s ability to resist the transfer of heat, it is specific to a particular thickness of material. Units: m2K/W. Commonly known as the U-value, it is a measure of the rate of conductive heat loss of a building element or component. Units: W/m2K. The actual thermal transmittance of a building element is a function of the thermal resistance of the materials that are used in the construction and the way they are assembled. U-values of building elements can be established by laboratory testing, but the process is costly, time consuming and size limited. Furthermore, the result would only hold true for an identical construction or element. Testing is widely used to establish the thermal transmittance of glazing and doors, but for other construction elements it is more normal to use numerical and mathematical models to predict the U-value. In its simplest form, a U-value is calculated by establishing the thermal resistance of each layer in the construction element and adding them together to provide a total resistance (TR) value. The U-value is calculated from the reciprocal of the combined resistances of the materials in the element, including any airspaces and surface resistance values. 3.50m2K/W would have a U-value of 1/3.50 or 0.29W/m2K. This method of calculating U-values, however, does not allow for nonuniformities that exist in real constructions and therefore will not enable a realistic model to be calculated. The non-uniformities require factors to include allowance for the effect of repeating thermal bridges, (e.g. timber studs in timber frame construction, mortar joints in lightweight and aircrete masonry or metal rails and clips in twin metal skin constructions), fasteners that penetrate the construction and the possibility of the imperfection of fit of layers that might allow air movement around insulation layers. These factors are included in more sophisticated numerical and mathematical models. These methods are defined by international standards such as BS EN ISO 6946 ‘Building components and building elements – Thermal resistance and thermal transmittance – Calculation method’ and guidance is given regarding the suitability of each method for the proposed construction. Additionally, reference should also be made to BR443:2006 Conventions for U-value calculations 2006 edition which sets conventions for and gives guidance on the calculation of U-values. Generally, the Combined Method is suitable for most elements of construction except where there are metal repeating thermal bridges in the insulation layer. If the example above is taken to be a timber frame panel, then it becomes apparent that the insulation is bridged by the timber studs. In these circumstances, the combined method is appropriate. When the combined U value method is applied to the calculation of the U-value of this construction it becomes 0.32. In this calculation, the proportion of insulation replaced by timber is 15%. This proportion is identified as the default timber fraction in BR443, and a level 0 correction for air gaps in the insulation layer has been applied because mineral wool is deemed to be cut with a positive tolerance so that it has to be compressed between the timber studs to be fitted and cross joints are compressed together. If a rigid foam board has been used, it might be considered necessary to apply a level 1 air gap correction because the board has to be cut with a negative tolerance to enable fitting and there may well be air gaps greater than 5mm in width. Clearly the accurate calculation of U-values requires detailed knowledge of product characteristics, calculation methodologies and standards, and construction techniques. The accurate calculation of U-values is a fundamental building block in the development of whole building energy models and Building Regulations submissions.